Sometimes, it’s all too easy to wander off while the stove is going and there is an open flame. Here are some tips for fire safety in the kitchen. We all know how busy your life can be, with kids and pets running everywhere and meals to cook and prepare. Sometimes, it’s all too easy to wander off while the stove is going and there is an open flame. 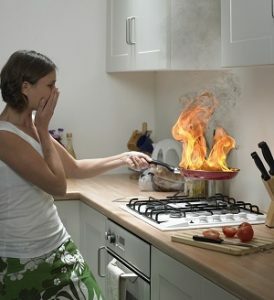 Here are some tips for fire safety in the kitchen. Attentiveness is key to fire safety. Whether you’re using the stove or the oven, anything near a heating element can become a potential fire hazard. If for any reason you have to step out of the kitchen or divert your attention, it’s better to turn off the fire. Even when the burner is off, it’s still giving off heat, so take the pots and pans away. That way you can prevent the most common source of kitchen fires from surprising you when you already have enough on your mind. You should make it a house rule than anyone who is not directly involved in helping you cook should stay outside the kitchen. In other words, don’t let too many people in; you can phrase this rule however you like – for instance “all nonessential personnel, please clear out.” This fire safety rule is especially important for mischievous children who might hurt themselves when you can’t look after them, or pets who are curious about walking near the stove to sneak a bite of what you’re cooking. Decide whether you’d like to set a timer on your phone, your smart watch, or any other device you choose. You can even set a countdown timer on your microwave if it has such a function. This way, once something is in the oven, you can remember to come and check on it after a specified interval, so you can go back into the living room and relax for ten or fifteen minutes before the timer goes off. By doing this, you can avoid burning whatever you’re cooking, roasting, and baking. Don’t forget to check on the condition of the fire extinguisher in your home. You might want to keep one in the kitchen and one in the laundry room, as well as in the garage. If you have multiple kitchen spaces, including one in your basement or an outdoor kitchen, you should equip each of them with a fire extinguisher in case a fire should start unexpectedly. This entry was posted on Friday, April 13th, 2018 at 9:39 am. Both comments and pings are currently closed.